If you play golf, there is no doubt that you’d like to play better. You could start by playing more, practicing more, take more lessons, and of course you could spend a boat load of money on equipment. What maybe you haven’t considered is trying golf fitness. Golf fitness isn’t necessarily going to change the way you swing the club or fix your swing flaws. However, golf fitness can surely increase both your range of motion, swing speed and add a few yards to your drives. It may even help you develop better tempo and more consistency. One thing is for sure, golf fitness is be easy, effective and affordable. 45 minutes or more of strength training, and cardio is what you might do in a typical workout. However, golf fitness is different and Ken Pierce from GolfGym joined the Golf More Swing Less podcast to discuss golf fitness and what it is and what you can do to build a healthier golf swing. Most people including golfers are scared off by the commitment of a gym membership or thought of a workout regimen. However, 5-10 minutes a day, 3-5 days a week is all you need to increase your swing speed and build a healthier golf swing. In fact, Ken is going to walk you though how to do it with some of the fantastic GolfGym products. Ken and his wife Vicki Pierce own the GolfGym company have surrounded their original Power Swing Trainer product with a range of products all designed with the same intent: to improve a golfer’s conditioning through the use of golf-specific training products. 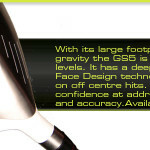 If you looking for an alternative to play better golf, stop by www.GolfGym.com. They have a variety of products and bundles, all at affordable prices. My personal favorite is the Power Swing Plus and the Power Swing Trainer. GolfGym also has a Blog and YouTube page packed with great golf tips and educational golf content. GolfGym is offering a 10% off promo code. Go over to www.GolfGym.com and use promo code GMSL10. Otherwise, you can purchase the GolfGym PowerSwing Trainer right here through my Amazon affiliate link.